The Lifelong Friend of NEO-RLS Award is presented in recognition of an individual who has significantly supported NEO-RLS over time through their service, membership, passion and advocacy. Nominations are made by the Board of Trustees and take into account service contributed, membership status and advocacy. Selection of the recipient is made by the Board of Trustees. The winner of the 2017-2018 Lifelong Friend of NEO-RLS Award is Denise Cardon, Library and Help Desk Manager, Northeast Ohio Medical University (NEOMED). Denise has been with the Aneal Mohan Kohli Academic and Information Technology Center Library at NEOMED for almost 19 years. In her various capacities she has served as a member of the Higher Learning Committee Tech Team, a member of the North Central Association of Colleges and Schools self-study team and a member of the Liaison Committee on Medical Education Planning. She has also served as Chair of the OhioLINK Statewide Intercampus Services Committee and held a leadership role in the Library Refresh project. Denise has been a member of the NEO-RLS Board of Trustees, serving on the Bylaws and Policies Committee during her Board tenure. She has also served as a non-Board member of the NEO-RLS Finance committee on a continuing basis over the years, providing critical and insightful input. NEOMED has been a member for many years during her tenure and Denise is an outspoken advocate for member libraries and for the value of the regional library system. She comments, "Libraries are a great way to serve others. Where else you are given the opportunity to touch on and impact so many lives - in so many different ways? You can touch the lives of those you know and see - to those you never see and are reaching remotely. We are one of the best community services out there. Libraries work hard - together. NEO is a great example of many individual entities benefiting from one. What NEO does for libraries, libraries, in turn, do for their communities." 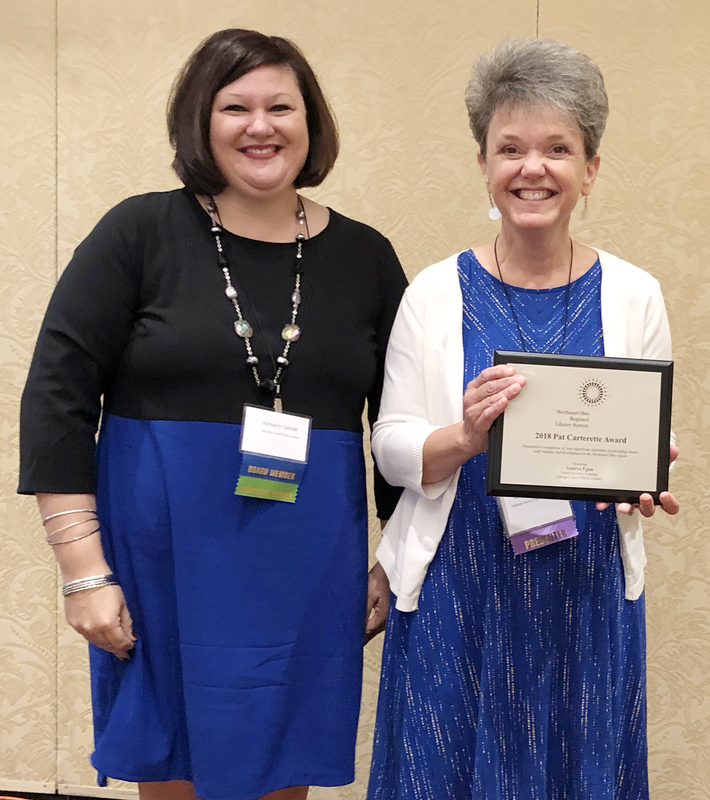 The NEO-RLS Pat Carterette Award is presented in recognition of an individual who has significantly assisted NEO-RLS, at no cost, in providing library staff training and development in the Northeast Ohio region during the past fiscal year. Nominations are made by the NEO-RLS staff and take into account the time contributed, content relevance and need, and regional impact. Selection of the recipient is made by the Board of Trustees. 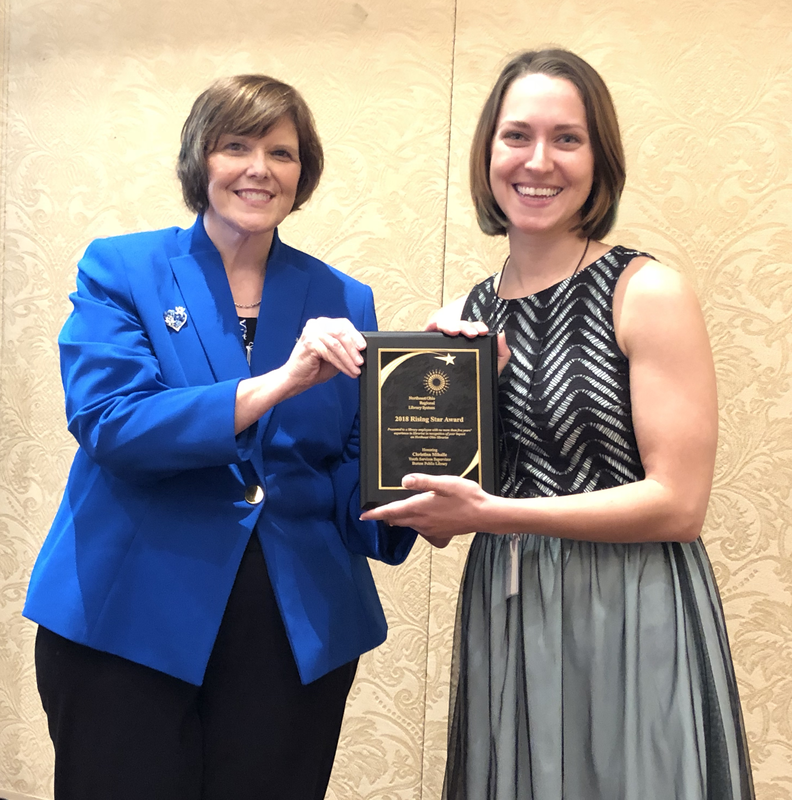 The winner of the 2017-2018 NEO-RLS Pat Carterette Award is Andrea Egan, a thirteen-year veteran of the Geauga County Public Library system. Andrea traveled around our region to present at each of the four "Day for Circ Staff" workshops, also assisting in multiple ways at each location. She then graciously presented the "Welcoming Library" webinar which was attended by over 40 people. No matter the environment, people continue to challenge and fascinate Andrea, and to encourage her to keep honing the customer service skills she has developed over the years. She especially enjoys the spontaneity that children bring to her job as a Youth Services Assistant at Geauga West and the diverse patrons and their questions they ask her while working at the Reference Desk. The NEO-RLS Rising Star Award recognizes an individual who has been working in libraries less than 5 years but is already making a huge impact and is, in fact, a rising star in northeast Ohio. Individuals are nominated and the selection of the top 3 nominees and the Rising Star Award recipient is made by Beverly Cain, State Librarian, State Library of Ohio. The top three nominees this year were Chistina Mihalic, Youth Services Manager, Burton Public Library, Joe Phommavichit, Public Services Assistant, Madison Public Library, and Chirstine Sholes, Marketing/Technology Librarian for the Milan-Berlin Library District. The winner of the 2017-2018 NEO-RLS Rising Star Award is Christina Mihalic, Youth Services Manager, Burton Public Library. Christina worked diligently upon being hired to improve the Children's space and collection. Her considered updating and decommissioning decisions increased total juvenile circulation in both 2016 and 2017. Christina has a group fitness certification and leads a movement and music family storytime that averages over 31 attendees per session. Her varied programs for children include Scottish dancing, art, and technology ranging from Makey Makey to 3-D printing. Burton Public Library had its highest annual program attendance in 2017 by over 3,000 more people in part due to Christina's variety of program offerings, her engaging storytimes and her outreach to Burton Elementary. Christina is a Pete the Cat enthusiast and vigorously dedicated to anything that will get kids moving, singing, dancing, using their imagination, learning, and of course, reading! Christina full believes that libraries are community centers, and she has dedicated her time to making her library the center of engagement.